Ronald Darby not only fought the good fight, he won it. This might not be apparent from the stat line that shows Atlanta megastar wide receiver Julio Jones with 10 catches for 169 yards Thursday night, but it is true, nonetheless. Jones, a five-time Pro Bowl selection, did not score a touchdown, matched against Darby, the Eagles' top corner, whenever Jones lined up to his left, or against Jalen Mills on the other side. He was targeted an astonishing 19 times in 43 Atlanta pass attempts. Ten catches out of 19 targets for the guy who might be the NFL's most dominant receiver is not a bad evening's work for the opposing secondary, especially if you're playing to keep him in front of you, and that is where he stays. Jones' longest gain of the night, 36 yards, came on Atlanta's final drive, Jones got inside Mills and cut across the middle. The last play of the game, first-and-goal from the Eagles' 5, Jones and Darby were one-on-one, the ball went up to Jones at the end-zone side boundary, the mirror image of the final Falcons play of the Eagles' playoff victory last January. That one, the Matt Ryan pass floated over Jones and Mills and out of bounds, on the right side. This one, Jones managed to pull in the ball, but Darby had him boxed out from the green-painted grass; Jones came down well out of bounds, and the game was over. "Last game, JMill made the play, this game, I made it," Darby said. "They were in a stack. Working together were me, Sid [Jones] and Rod [McLeod], and [Julio Jones] came out to that pylon. My first thought was he was either going to try to hit an angle [cut inside] or like, a back-shoulder stop. So I tried to stay patient with my eyes, instead of looking back real fast. I kinda heard the crowd; the crowd will let you know when that ball is in the air. It's [a sound like] somebody dropping something. So when I heard that noise, I looked back, I saw the ball, I tried to get it. I went up to be aggressive with it. We both came down out of bounds." Darby said he tried to mimic Mills' celebration after the play on Jones in the playoff game. "But I was tired; I couldn't run all the way down the field. I ran through the end zone, celebrated with my boys, called it a night." Darby finished with five solo tackles and three passes defended, on a night when middle linebacker Jordan Hicks said "we have confidence we can make a stand; we have confidence that as long as we've got a blade of grass [in front of the end zone], we can defend it." Hicks and the defense shook off the fourth-down illegal contact penalty on him that gave the Falcons their final shot. "Demoralizing," Hicks said of the penalty. He said the receiver ran straight at him and they bumped. "I honestly can't put our defense, our team in that situation. As ticky-tack as I feel that call was … I need to be more disciplined. I can't put my hands on him." Darby said one of the best things about the Eagles' defense is that when someone makes a mistake, as Hicks did (at the end of a monster night in which Hicks recorded five solo tackles, 1.5 sacks, and two quarterback hits), "nobody points fingers." The Falcons managed one touchdown in five trips to the red zone. *Zach Ertz caught five passes for 48 yards, including Nick Foles' longest completion of 18 yards, but Ertz was targeted 10 times, and he had three drops, something that just never happens. He also took an odd/silly pass-interference penalty for throwing a halfhearted pick at Falcons defensive lineman Grady Jarrett, for some reason. "It was just not a good game. I don't think I've ever had that many drops in a game," Ertz said. "Gotta play better. Can't dwell on it. Fifty-two other guys count on me to move on." Ertz had a good block on Jay Ajayi's second touchdown run. *Malcolm Jenkins said he did not raise his fist during the national anthem Thursday because "in any movement, you have to have movement and adaptation. … There are so many players that are doing things in their communities, that it's now time to really highlight that and push that work and those issues into the forefront, especially with the elections that are coming up." *Fifty-three snaps for 25-year-old wideout DeAndre Carter in his first regular-season game, after three years on various practice squads. Only one catch for 10 yards, but overall a much bigger role than projected. Shelton Gibson returned kickoffs – one really well, for 30 yards, and one really poorly when he brought a kick out of the end zone and was swarmed at the 10 – but Gibson had no offensive role, on a night when his speed down the field might have seemed useful. "It's just that DeAndre right now is more of an inside receiver and Shelton is more of an outside guy," Doug Pederson said. "We moved Nelson [Agholor] outside a little bit more in this game, which allowed for DeAndre to play. And then we put DeAndre at the point where he was having to block safeties, and he does a nice job there. It was a little bit by scheme, but also the way the game kind of played out." *Falcons safety Keanu Neal came back into the game after suffering a knee injury, only to have his left leg buckle under him in coverage. The Falcons announced Friday that he had suffered an ACL tear and is out for the season. *With predecessor Donnie Jones on hand for the Super Bowl LII festivities, Eagles rookie punter Cam Johnston launched some bombs. Johnston's gross on six punts was 52.2, his net 47.0. Longest went 65 yards. *Hard to fault rookie tight end Dallas Goedert on the interception that blooped out of his hands, right to Atlanta linebacker Deion Jones. Falcons safety Damontae Kazee timed his hit perfectly, putting his helmet on the ball just as Goedert tried to bring it down. The pick set up Atlanta's only touchdown. That wearing No. 23 would make it mandatory that you drop an interception thrown right into your hands? 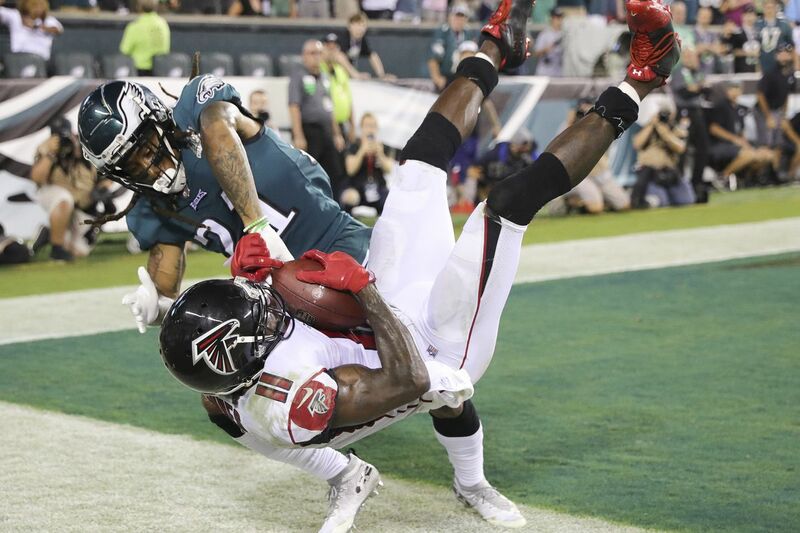 Happened to both the Eagles' Rodney McLeod and the Falcons' Robert Alford Thursday night. Eagles wide receiver Nelson Agholor finished the game with a better passer rating than either quarterback (118.8), after throwing the new "Philly Philly" pass to Nick Foles for 15 yards, and he also posted a better yards per carry than any running back on either team, Agholor zipping 16 yards on an end-around. It was his only carry. Tre Sullivan's first NFL game also was his last, at least for a while. Sullivan created a memory that was not exactly what he'd dreamed of doing in that situation. That was what happened, the Eagles adding both Hall and suspended linebacker Nigel Bradham Friday afternoon. Putting wideout Mack Hollins on injured reserve Thursday created space for Bradham. Hall got Sullivan's spot. Many Eagles fans probably weren't aware of Sullivan until Atlanta rookie linebacker Foye Oluokun grabbed Sullivan and pulled him into a bouncing Falcons punt that landed far too short for Darren Sproles to field Thursday night. It went down as a fumble. "It's on me. I gotta listen to the 'poison' call that Sproles gave. I just kinda heard the crowd yelling; I thought he had the ball and was returning the ball," Sullivan said after the game. "I was just trying to make a block, and unfortunately, I got pulled into the ball. … It's a mistake I'll learn from and make sure it doesn't happen again." In his 13 special-teams snaps, Sullivan said he learned that the regular-season NFL is "not like preseason games at all." The Eagles also shook up the practice squad Friday, signing defensive tackle Treyvon Hester, and releasing wideouts Greg Ward and Rashard Davis, along with defensive tackle Winston Craig. The team likes to shuffle the practice squad to get a look at as many players as possible. It wouldn't be a surprise to see any or all of the three who were released return.